TAKING POSITION | THE POLITICAL AND PLACE, Experimental Course in Performance Studies (ECPS) is designed as a proposal of encounter with-in study, a process of study for encounters to be, throughout the convergence of reading practices, discussion, research and experimentation: a three month course to experiment with tools, methodologies, issues, concerns, problems and limitations related to Performance Studies, in order to interrogate our present. Emphasizing the contingency of critical thought production, the course is characterized by a tight relation between the performative and the experimental, with a strong focus on the conversation between the several fields at stake: theatre, dance, music, performance, architecture, anthropology, philosophy, politics, history, critical theory, literature. It encompasses a continuous workshop intended as a common thread throughout the course, and three thematic axes. The continuous workshop, Problems in Performance Studies (September 19 to December 5, Mondays from 6:30pm to 9:30pm) addresses the epistemological, aesthetic, and political complexity of this field of study, working on a set of operational key-concepts that appear as fundamental to approach issues that have been recurrent within the field of Performance Studies: performance, performer, performative, performativity, performing, reperformance. Starting by positioning these terms in their historical contexts of emergence, we will then experiment with their possible displacements, assembling materials from several geographies, registers and media. Their repositioning will suggest them other tonalities and modulations, which enable the extension of their implications across distinct fields of artistic and theoretical practice, taking into account the forms of life that sustain them. The Course is addressed to anyone interested in research issues and experimentations related to the field of Performance Studies. TEAM: Ana Bigotte Vieira, Ana Mira, Ana Riscado, Fernanda Eugénio, Joana Braga, Paula Caspão, Ricardo Seiça Salgado and guests. REGISTRATION: Full fee: 450 Euros. With grant: 300 Euros. DEADLINES: Registrations are open until July 15 2016. Please send your application to baldiohabitado@gmail.com, with your name, a biographical note and a motivation letter (up to 400 words). GRANT: It is possible to be offered a 150-euro grant, to be deducted from the full fee of the course. To apply, please send a letter briefly explaining the reasons of your request (up to 300 words), and add it to your application. This entry was posted in Uncategorized on 7 de July de 2016 by ricardo seiça salgado. Whether it is a gathering of people, efforts, knowledge or means… meeting seems to be an essential condition for collective action. It’s also an essential element for stage work. A meeting is at once a beginning and a moment of refelction. Meetings always exist in context, as situations, and depend completely on who is having them, how they’re organized, and for what purpose. They’re absolutely performative. Being, as such, a peculiar kind of action, they precede other more visible actions: they function as backstage for these actions, the place where decisions are made. Google this term and you’ll get: parent’s meetings, workers’ meetings, summits, masses, job interviews… You’ll find ‘meetings of’ and it’s this ‘of’ that gives the ‘meeting’ a shape and tone, begging the question of what a meeting is, what kind of performance it enacts, in the case of an ‘of’ that is not a given, but something in process, made of companionship, consensus, disagreement, conflict, participative decision making; when this ‘of’ incorporates the specific ecology of a place. If meetings can be seen as performative practices (implying a distribution of roles and functions), performance practice is based on the act of meeting. Theater is always a collective construction. Any show gathers public and actors, traditionally on two sides of the stage lights, a relation that has evolved to situations where actors and participants gather side by side in community projects or participatory practices. We propose to turn things upside down, looking at this moment that lies between what we’ve done and what we’re going to do, that opens up the future from a reflection on the past. As it feels necessary to reactivate the potential for a possible collective action, as much as to understand the forms, limits and possibilities of its being put in practice, we propose that the theater (a meeting place of sorts) become a meeting. Making use of all the different kinds of meeting (possible, desirable, imaginable, feasible), Maria Matos Theater and baldio propose that for two days we meet in the theater, in a series of events that explore variations on this kind of meeting: a meeting of meetings in the theater. Guest participants: André Lepecki, Sílvia Pinto Coelho, Rui Catalão, Ana Bigotte Vieira, Joana Braga, UNIPOP, Casa do Vapor, AndLAb, DEMIMONDE, Primeiros Sintomas, OBSERVATÓRIO DAS TRANSFORMAÇÕES XXXX DA CIDADE DE LISBOA, Corpo de Multidão, ARTÉRIA, PEDRAS and Stress.FM. Sundry edibles generously contributed by Chef Rø. This entry was posted in Uncategorized on 19 de March de 2014 by baldio. Building on the experience lived in the construction of Casa do Vapor – a place to experiment, to exchange and share modes of knowing -, we propose a re-acting (re-enact/react) in search of the construction/activation of an idea, a temporary space, a place where it is possible to act, to perform, to react and interact. A practical workshop exploring wood as a building material will establish connections and promote shared moments that will enable dialogue and finding resignifications. Casa do Vapor (Steam House) is the outcome of a partnership between the EXYZT collective, the Ensaios e Diálogos Association and the Cova do Vapor Residents Association – it’s an ephemeral cultural center and a new meeting point for local community and outside visitors. It was created as a space to stimulate sharing, learning, artistic creation and experimentation, in order to increase active participation and cultural value in the community at Cova do Vapor. 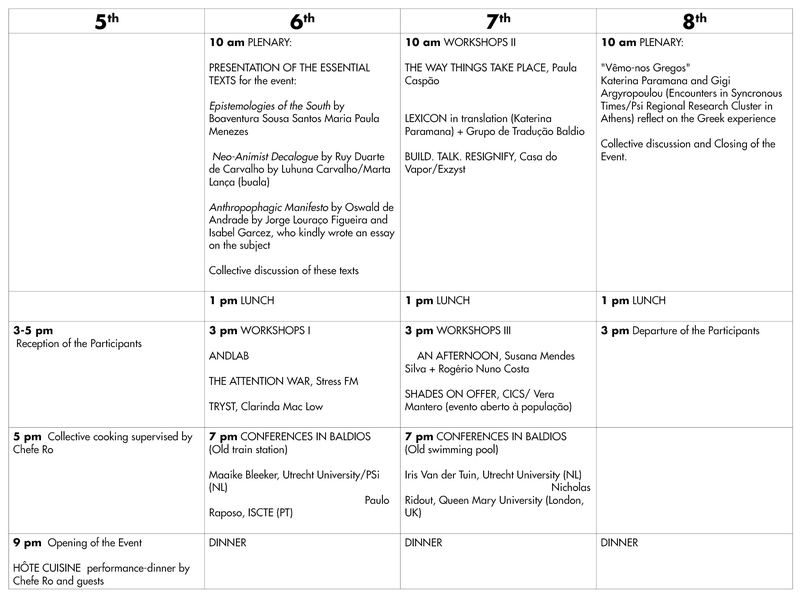 From April to October 2013, Casa do Vapor opens its doors and hosts a diverse cultural program. Besides artistic residencies and activities for the community, the Casa is open to everyone as a catalyst and incubator for new ideas and projects. Occupying the Adua land for one day. Occupying its trees and/or their respective shades. Making it a kind of “grand portrait”, a 79 acre portrait, that you can walk or ramble on, discover, drift, get lost in, and where the ideas, necessities and existential desires that run through projects like CICS, Transition Movement, Degrowth, and the like, can be seen. When Indirections made their proposal they said, among other things, that “your working session can be theoretical, practical, or both; it can even consist in climbing trees…”. Between theory and practice, the tree hypothesis was what stuck in my mind! So this was the proposal I made to the CICS members and to several inhabitants of Montemor, and that finally we all proposed to Generative Indirections. Vera Mantero was born in Lisbon in 1966. She studied classical dance until she was eighteen. She worked for five years in the Ballet Gulbenkian, in Lisbon. In New York and Paris she studied contemporary dance technique, voice and theatre, and by then she completely cut with her ballet origins. As a dancer she also worked in France with Catherine Diverrès. She started creating her own choreography in 1987 and since 1991 she has been showing her work in theatres and festivals in Europe, Brazil, USA, Canada and Singapore. The concept of performance: who needs it? “Does the global South need the concept of public sphere?” wonders Boaventura de Sousa Santos in his “Public Sphere and Epistemologies of the South”. The concept of public sphere reflects the political practices of the European bourgeoisie at the beginning of the eighteenth century and its theoretical and cultural presuppositions are closely connected to the history of Western Modernity. They are not necessarily universally valid, even when they purport to be general theories Similarly, one might ask: does the global South need the concept of performance? The emergence of performance as key concept in a variety of fields and discourses is, Jon McKenzie argues, closely connected to the development of post WWII Western (and in particular US) societies, including the rise of neoliberalism and the transformations in practices of knowing characteristic of what Lyotard has famously termed the postmodern condition. This raises questions similar to those brought up by Boaventura with regard to the public sphere. How to keep distance without “throwing all this rich tradition into the dustbin of history”? I will explore the possibilities Boaventura’s “doubly transgressive sociology of absences and emergences” for a counter hegemonic approach to performance (and by extension to Performance Studies). I will do so through Maria Hlavajova’s concept of the Former West, recent research into processes of canonizing in Performance Studies, and Chantal Mouffe’s critique of Habermas’ understanding of the public sphere. Maaike Bleeker is a professor of Theatre Studies, and the Head of School of Media and Culture Studies at Utrecht University. She graduated in Art History, Theatre Studies and Philosophy at the University of Amsterdam and obtained her PhD from the Amsterdam School for Cultural Analysis (ASCA). Since 1991, she is also active as dramaturge in theatre and dance. She is the author of Visuality in the Theatre (Palgrave, 2008). She has published extensively in international journals and edited volumes and edited several books including Anatomy Live: Performance and the Operating Theatre (AUP 2008). She is currently preparing a monograph titled Corporeal Literacy and an edited volume about dance and digital technology (titled Transmission in Motion). Maaike Bleeker is president of Performance Studies international and was the organizer of the 2011 world conference of Performance Studies international, titled Camillo 2.0: Technology, Memory, Experience. Theatre has been the main fuel for protest actions, demonstrations and revolutions. But when we think about the so called “new/new social movements” contemporary protests, are we talking only about theatre performances or can we define them as performance activism, or in another way perhaps, as re-performance or re-enactment? Archive, documentation, presence and mediatisation become central in the struggle for information and mobilisation. Thus, performance activism is a rhizomatic system built on street demonstrations and civil disobedience actions, occupation of public space, and above all on internet resources, namely agit-prop images and life streaming assemblies, marches or other forms of protest. So, if the revolution will not be televised, will it be downloaded? Paulo Raposo has a PhD in Anthropology and Professor at the University Institute of Lisbon (ISCTE-IUL). Senior researcher at CRIA (Center for research in anthropology). From 2000-09 he was a member of the editorial board of Etnográfica, and had various positions on the board of several anthropological associations and research centres in Portugal (APA, CEAS, CRIA). He conducted research in Portugal working on body, ritual, heritage, tourism, social movements, and cultural performances. He worked in several performative structures in Portugal and was the curator of No performance’s Land – Conferences and Performances (Lisbon 2011). He is author of articles, chapters and books on ritual, tourism, heritage and performance issues. He recently publish Por Detrás da Máscara. Ensaios sobre antropologia da performance entre os Caretos de Podence (Portugal, 2011) and he his co-author of No Performance’s Land – Performance: a terra do não lugar (Brazil, 2013, forthcoming). He is also a political activist. Many critical thinkers and activists today look at the past in order to devise strategies for inclusive futures (of sexual differing, of anti-racism). Think of Elizabeth Freeman’s ‘temporal drag’ and Ulrika Dahl’s femme-nist feelings of ‘vintage’. Consider studying post-colonial classics such as Oswald de Andrade’s ‘Anthropophagic Manifesto’ from 1928 or turning to minor (e.g. African) histories. In my contribution I ask how anachronistic leaps come about. How do we leap into futures of the past? Owing to the fact that there’s also a certain anachronism to post-feminism or post-colonialism (post-feminists deem feminism out of time and have prematurely buried it; post-colonialism’s temporality is more complex), I wish to provide a precise discussion of ‘generation’. Generation asks how we can classify ideas (following the etymological root of genoi), as well as how ideas are generated and remain generative (genesthai; to come into being). The intimate relation between genoi and genesthai makes clear how we should not put temporally linear patterns aside all too quickly; indirections are entangled with directions. I will argue that here is much potential to extend and refine ‘generation’ for the project of this regional cluster of Performance Studies international. Iris van der Tuin is assistant professor of Gender Studies and Philosophy of Science at Utrecht University, the Netherlands. She edited Doing Gender in Media, Art and Culture (Routledge, 2009) with Rosemarie Buikema and authored New Materialism: Interviews & Cartographies (Open Humanities Press, 2012) with Rick Dolphijn. Her articles have been published in Australian Feminist Studies, European Journal of Women’s Studies, Hypatia: A Journal of Feminist Philosophy, NORA – Nordic Journal of Feminist and Gender Research, Women: A Cultural Review and Women’s Studies International Forum. Nicholas Ridout’s talk for Generative Indirections will explore some of the possibilities opened up by thinking about the theatre of the British enlightenment in relation to ideas, experiences and practices arising from the presence of the ‘south’ within the celebrated ‘public sphere’. The starting point for these reflections is a short text called ‘The Trunkmaker’, published by Joseph Addison in a 1711 edition of The Spectator. Nicholas Ridout is Reader in Theatre and Performance Studies at Queen Mary, University of London. He is the author of Stage Fright, Animals and Other Theatrical Problems (Cambridge University Press, 2006), Theatre & Ethics (Palgrave, 2009) and Passionate Amateurs: Theatre, Communism and Love (University of Michigan Press, 2013). With Joe Kelleher he edited Contemporary Theatres in Europe (Routledge, 2006) and co-wrote (with members of the company), The Theatre of Socìetas Raffaello Sanzio (2007). This entry was posted in Uncategorized on 31 de August de 2013 by baldio. The event will have the format of a residency, organised in plenary discussions and workshops. 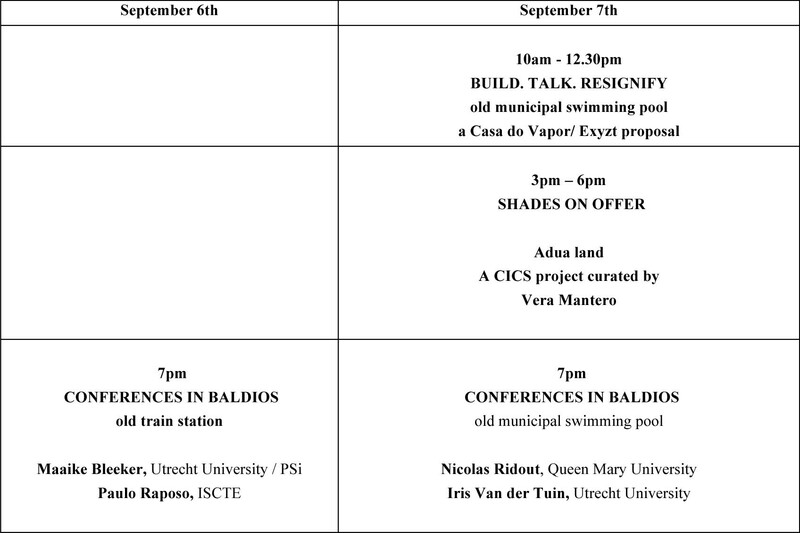 At the end of the day, keynote lectures, open to the general public, will take place at baldios or commons, in abandoned public land, in a performative gesture. Please download our program here. Researching the relations between ongoing artistic, social and political forms of life, Generative Indirections intends to explore the potentialities of performance studies in the critical space between the Social Sciences, Humanities and Art, and give voice to counter hegemonic epistemologies, blurring theory and practice. In-direction thus becomes a magnetic field, moving between theory and practice, challenging disciplinary boundaries in order to question how Performance Studies can be received in Portugal. The idea of hospitality, a doing-together, is the modus operandi for this international event, through which we hope to build a dialogue whose boundaries are necessarily broad.Hospitality can be understood as an embodied cultural practice of receiving and being received that opens possibilities of negotiation between public and private, informality and reflexion. As a performative practice, simultaneously affective and political, it encourages the construction of bridges between modes of knowing and modes of being. We ask how Performance Studies can currently be received in Portugal, questioning the context of where we come from and the productive possibilities of what we can be. This entry was posted in Uncategorized on 11 de August de 2013 by Isabel Brison.